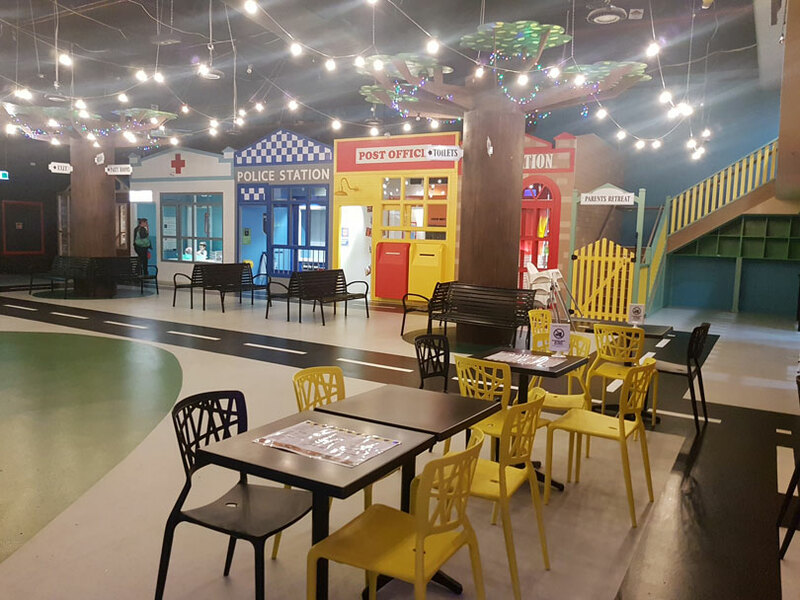 If you have a child that loves imaginary play, then Wannabees is the place for them! 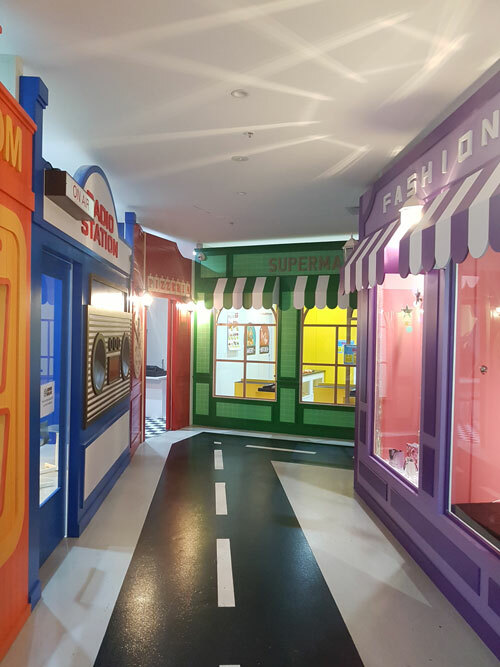 It’s way more than your average playcentre, it’s a child size town with replica shops, amenities and props where kids can role play for hours on end – it’s the perfect way for them to discover what they ‘wanna be’ when they grow up! Here’s why we love it. Wannabees is set out like a little town, with shops next to one other. There’s a post office, vet, police station, construction site for little builders (we initially thought it was a real construction site and they were adding a new shop! ), hospital, beauty salon, supermarket, pizzeria, radio station and more. There’s also a road marked on the floor to make it even more realistic. 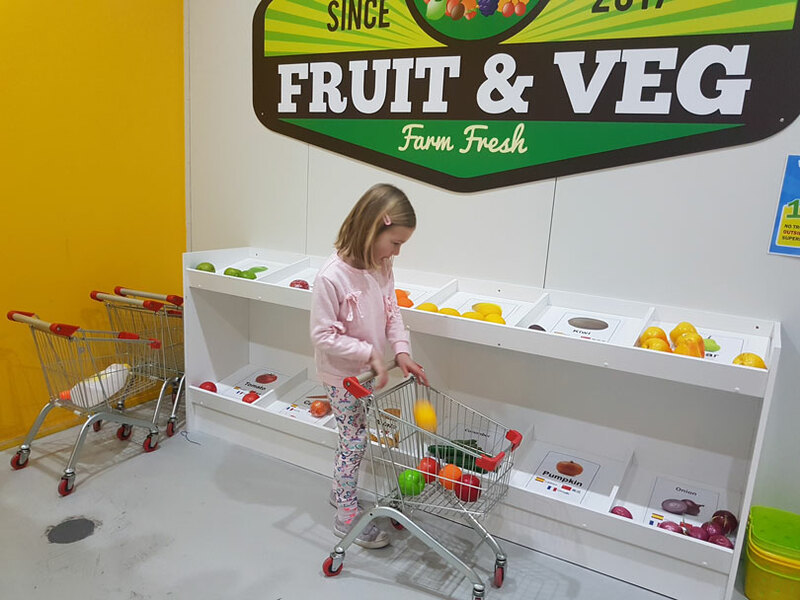 In each of the shops there are lots of appropriate and relevant props that aid creativity and play. 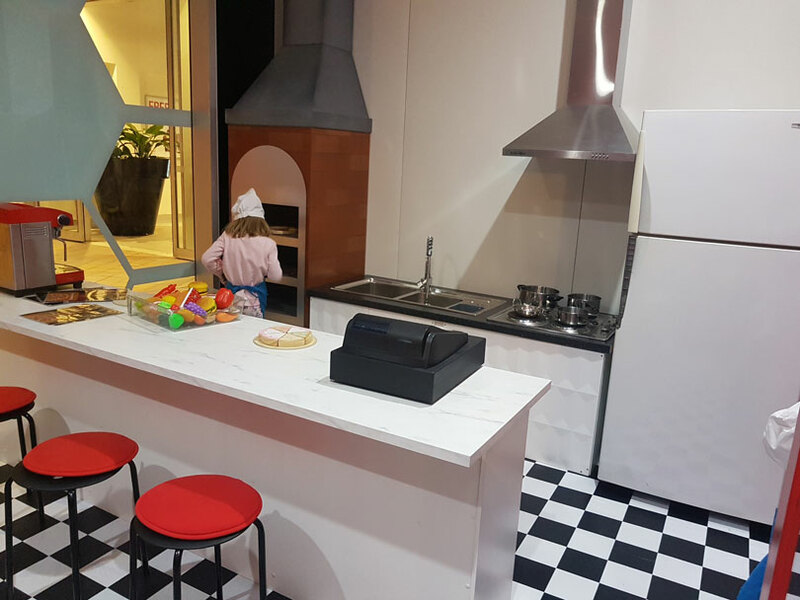 For example, the pizzeria has a pizza oven and ‘equipment’ to make a pizza, chefs’ hats and aprons, little table and chairs for patrons to sit at, menus on the tables and a cash register. 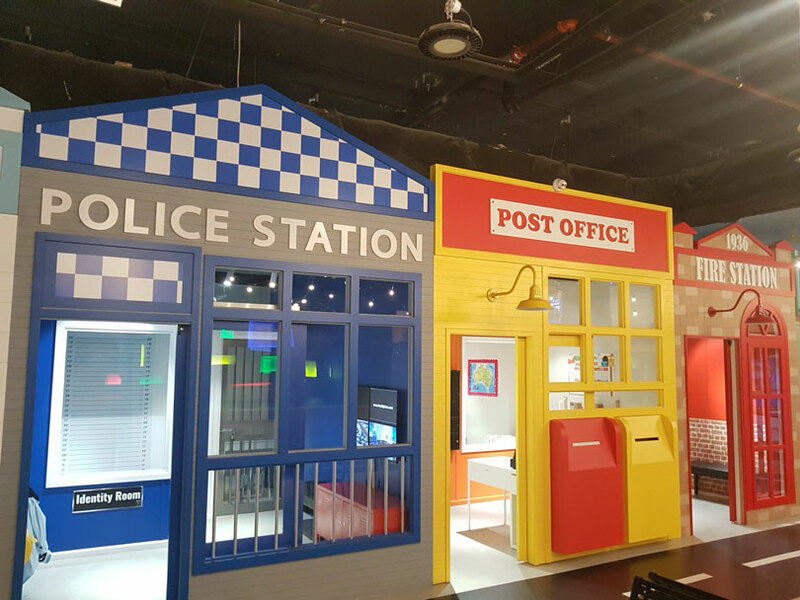 The post office has a counter, mail sorting area, and letters and packages – and when the postman is ready to make his or her delivery, each shop has a letterbox to receive their mail! In the vet, kids can tend to sick (stuffed) animals and also pretend to give the animals a bath. At the police station you can get your mug shot taken and at the hospital you can take care of the newborn babies. Unlike other playcentres, it’s not a case of entering the venue and then you’re on your own. During your visit you’ll see a staff member or two engaging with the kids. 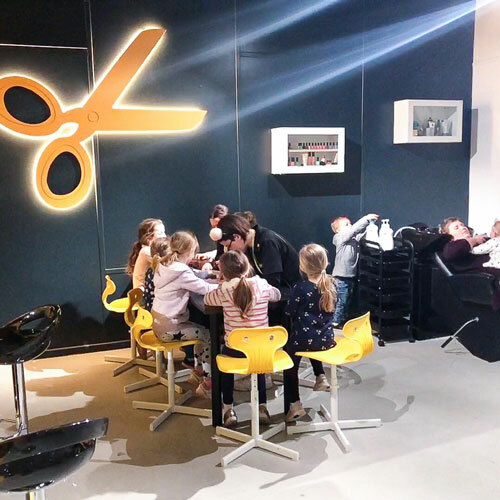 They may paint nails in the beauty parlour, or perform a fashion show after helping the kids choose a special outfit from the boutique to model. 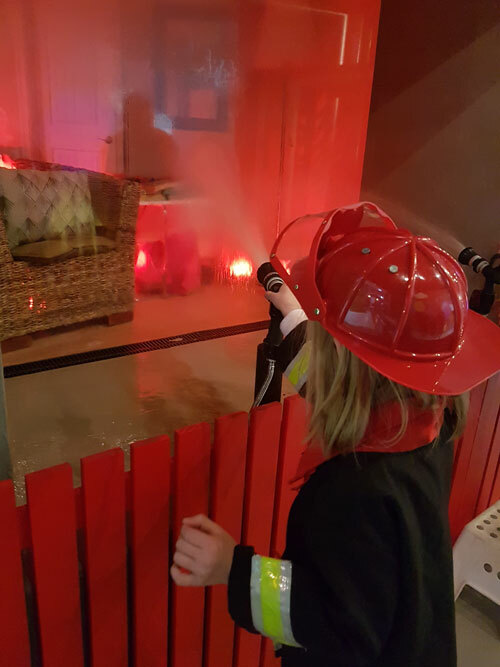 Another highlight was extinguishing the fire with actual water! We love that this is so much more than just playing. Kids are using their imaginations and creativity. If there are other kids there, they’re interacting and role-playing. It also assists them to understand a number of ‘life’ concepts – what’s involved in a particular job, the value of money and how it’s used, serving customers and more. For example, they might be the cashier in the supermarket, saving lives in the hospital, making someone a pizza or broadcasting the news. For parents, there’s a cafe and free WiFi – if you work remotely it would be a great place to take the kids and your laptop for a couple hours if you need to get a few things done! They’re also hosting a monthly disco on a Saturday night where parents can BYO beer and wine! Also, you can take smaller kids (i.e. toddlers / those that are a little too young to get into the imaginary play) as there’s a soft play area just for them. 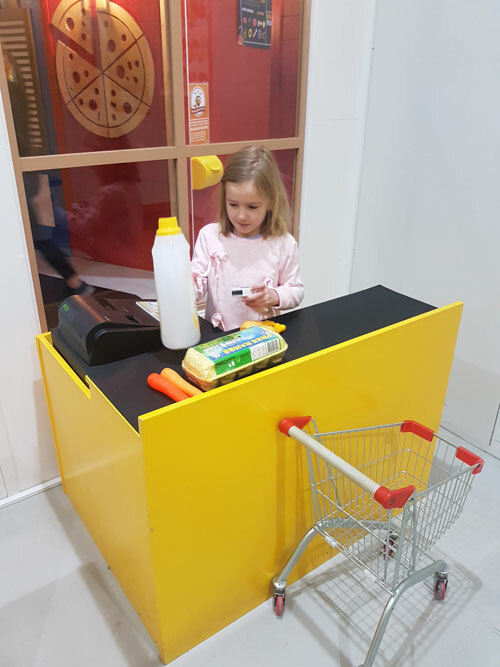 And there’s also a ‘drop and shop’ option for an additional charge if you have errands or shopping to do and your child is comfortable to be left. And of course Wannabees hosts birthday parties, which we imagine would be loads of fun! 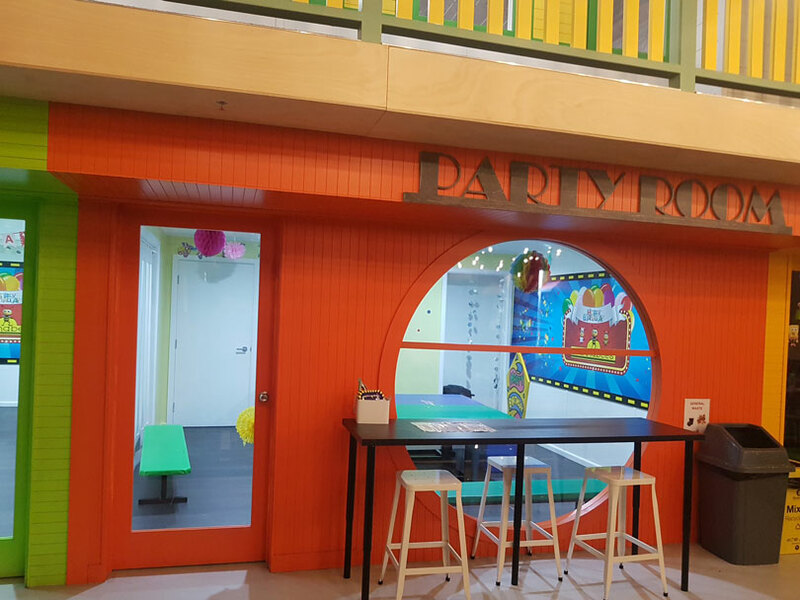 There are two party rooms and a variety of packages, from self explore to deluxe and which can also include adults food and various party themes. You can find out more about Wannabees parties here. One tip: If you’re heading to Wannabees Hornsby, it’s worth spending a few minutes to check out the location as it’s not the easiest to find. Our suggestion is to head towards the fountain outside Westfield (locals should know where this is if you need to ask someone). Once outside, Wannabees is near the restaurants that have outdoor seating and right next to Fernwood Gym. Click here for more info about how to find Wannabees. Shop 2042, 236 Pacific Hwy (Westfield Shopping Centre), Hornsby.